November's "Pillar of Defense" operation by the Israeli military included a couple of unpleasant surprises for Israeli citizens. For the first time, Palestinian terrorists fired missiles at the country's two population centers, Jerusalem and Tel Aviv, sending residents scurrying for shelter. For years, Palestinian rocket fire was isolated to smaller cities in southern Israel. Israeli military officials say weapons smuggled into Gaza via the new "Silk Route," a pipeline created and protected by governments including Iran, Sudan and others, made that dramatic new range possible. In a wide-ranging interview for the Investigative Project on Terrorism, a senior source in the Israeli Defense Force, speaking on condition of anonymity, explained how that smuggling works and what it means. "You can see how it goes between Iran, northern Sudan, via Egypt. It didn't gradually evolve and develop like the old merchant trail, 'The Silk Route.' It's not something built thousands of years ago. It is something that we believe government officials sat down and decided on. Let me put it this way; in such countries, under such regimes, we don't believe that anything is being done without the permission and knowledge of the local power." The official, whose assessments are based on his day-to-day experience of combating efforts to supply terror groups in Gaza, said the smuggling of more sophisticated weaponry was facilitated in part by upheaval in North Africa. "When we are talking about the smuggling of illegal arms into the Gaza Strip" the officer began, "we should focus on a few members of this notorious community; we are talking about Iran, north Sudan, Libya as a state, not a government, and of course, the Sinai Peninsula." 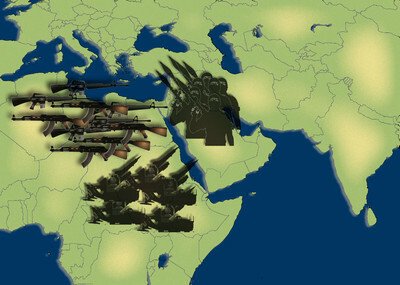 "Libya has become a serious problem since the fall of the Gaddafi regime because it is an open black market" he said. "Unlike Iran and Sudan, there is no government behind what is going on there. There were huge stocks of weapons (some of it western), that are now being offered to the one able to pay the highest price. The Palestinians are taking advantage of that. They will send procurements missions to look for specific items there (in Libya), or sometimes they are taking part in open auctions in Sinai to whoever will pay the most for weapons like SSR's, Anti-Tank Guided Missiles, MANPADs etc." The flow of arms from Iran to specific groups in Gaza has long been a major concern for Israel and others seeking stability in the region. A Western intelligence report highlighted by Reuters back in September, confirmed a long-held Israeli view, saying "Planes are flying from Iran to Syria via Iraq on an almost daily basis, carrying IRGC (Iranian Revolutionary Guard Corps) personnel and tens of tons of weapons to arm the Syrian security forces and militias fighting against the rebels." "Iran continues to be the major arms supplier to the Palestinian organisations" the officer said. They have been for quite a few years, every year spending many tens of millions of US dollars. Their main transfer route to the Gaza Strip is via north Sudan and Syria, we believe in cooperation with local governments, or at least with the awareness of such governments. The Iranians have used civilian cargo and civilian flights in order to deliver such shipments even without the knowledge of passengers taking seats on such flights." Israel believes that some of that weaponry found its way to arm Hizballah in South Lebanon, while some also arrived further down the line in Hamas-controlled Gaza. In September, news of the shipments reportedly prompted then-U.S. Sen. John Kerry to threaten to withdraw aid from Iraq, (where the planes sometimes stop in transit and through whose airspace the flights pass), unless such planes were stopped and searched as a matter of routine. "These were flights that originated in Tehran and went to Damascus, cargo flights or civilian flights with passengers/tourists flying without knowing that in the belly of the plane there are explosives and other such materials" the Israeli officer said. "Right now there are bans against the Iran Air cargo planes and Mahan Air (which are supposed to be civilian companies).These are restrictions led by the U.S. and Europe." No sooner had the recent Israel/Hamas conflict ended than Iran publicly pledged to re-arm its Gazan militias. The process had been made more difficult following the much publicised destruction of the Yarmouk factory in Sudan in late-October, blown up by a series of missiles strikes attributed by the Sudanese government to the Israeli air force. Sudanese Information Minister Ahmad Bilal Osman told Al Jazeera the day after the attack, "Israel has accused Sudan of sending arms to Hamas. These allegations are not correct." Intelligence showed that the factory was being used as an assembly point for Iranian Fajr5 missiles and other weaponry shipped to Sudan and subsequently transported through Egypt's Suez Canal. From there it was smuggled into Gaza through the network of tunnels overseen by the Hamas authorities. A massive increase in the trafficking of missiles from Sudan to Gaza corresponds with Hosni Mubarak's fall in Egypt, and the subsequent rise to power of the Muslim Brotherhood, (the parent organization of Hamas), and its leader, Mohammed Morsi. Palestinian terrorists have obtained Fajr5 rockets, anti-tank and surface-to-surface missiles and rockets that can travel 40 kilometers. What differentiates this route from others is the quality of arms coming through. It is what we call 'Equilibrium Breaking Arms,' things that are not that common in the area. Only the participation of governments in the armament process can deliver to Sinai. You don't get coastal missiles like we caught on the Victoria in March 2011 by purchasing them on Ebay. It is something that a government planned will come from a particular ship on its way to Egypt, then on through Sinai which is the bottleneck of all smuggling activities in the Gaza Strip." The interception of the freighter Victoria was one of three high-profile weapons seizures at sea by Israel during the last decade in which more than 450 tons of weapons were seized. Katyusha rockets, thousands of mortars, F-704 anti-ship missiles, two rocket launchers, two British-made radar systems, and tens of thousands of rounds of ammunition suitable for AK-47 assault rifles, were just part of the haul. Despite those raids, weapons still get through. "In 2009 Fajr5 rockets entered the Gaza Strip without us knowing about it. We discovered that later on. There is no 100 percent success in this field of business. We are doing our best to see that we are on any movement of such kind, but yes, of course we are never sure we know everything. We cannot allow coastal missiles to enter the Gaza Strip as then all merchant routes will be under threat. We have gas platforms now on the coast of Israel which could potentially be placed in danger by such missiles." The discovery in recent years of vast quantities of natural gas off the coast of Israel could prove a huge boon to the Israeli economy over the next generation, but the terminals are viewed as a prime target for terrorist attacks and their security is clearly of paramount importance to the Israeli Defence Force and security services. The other critical issue that the IDF officer touched on is the huge danger posed to both Israel and Egypt by the lawlessness in the Sinai Peninsula and the plethora of weaponry arriving there, much of it from the now dysfunctional Libya. Stopping those weapons from reaching Gaza has not proven to be a priority for Egypt, either. "They do not want any part of the Palestinian problem on their shoulders. If they stop the tunnel industry they will have to open more border crossings and let more supplies in, and that they don't want to do. But when it comes to Libyan weapons any group can go there [Sinai] to buy, say, anti-tank missiles or MANPAD's." Egyptian forces did intercept a consignment of U.S.-made anti-tank and anti-aircraft missiles smuggled out of Libya in early January, and another again two weeks later. These came at a time when Morsi was desperately trying to convince the U.S. that its offer of billions of dollars of aid and F16 fighters should be honored despite concerns over Morsi's governance. Last March, former IDF southern command head Yom Tov Samia went on the record on this issue, stating, "Egypt has been playing the same game since 1967: Whenever they want to be the bad guy, they're bad guys, when they want to be the good guys, they're the good guys. This situation has to come to an end. Egypt cannot continue to play the good and the bad guy whenever it's convenient for them." Open air auctions of lethal weapons are taking place in Sinai, and whoever comes up with the most cash, whoever they are, takes the goods and walks. "These weapons are then not under the control or 'political wisdom' of Hamas leaders or PIJ leaders. They might well end up under the control of a small group of Al Qaeda who might decide for themselves that they are now going to shoot at an airplane carrying European tourists travelling into Sharm El Sheik (Sinai resort), or shooting at an airplane landing at Aqaba [Jordan]." Sinai's increasing instability is a concern far beyond Israel, the source emphasized, and already serves as an open market for arms, raw materials and technology flowing into the Gaza Strip. "There are more and more contacts between Al Qaeda and the small groups in Sinai. Egypt finds it [Sinai] hard to police after years of neglect. As far I know there are a quarter of a million Bedouins that were never governed, that were, and still are discriminated against by local authorities...and they have lately become more and more religious. If at the beginning we saw these tribes supporting terror cells for the sake of money, now we see it becoming more an ideological support, and we see more and more cases that these groups of Al Qaeda-influenced extreme Jihadists are becoming more powerful than the tribes." "The attack of August 5 that killed 16 Egyptian soldiers has brought home [to Egypt] that the threat is not only against those who don't follow Allah, but also against less religious Muslims." This unique insight from someone so closely associated with trying to stop lethal weapons from reaching the hands of radical Islamists in the Sinai, paints a picture of a worrying broadening of the disparate groups and the massive danger that weapons from Iran and the barely functioning new Libya pose to the security of Israel and to Arab nations who don't currently espouse wholly radical Islamist views. "I believe that most people do not understand the threat to targets other than Israel by the open markets of weapons in the Middle East" the intelligence officer concluded. "I don't think that an American, European, or British customer understands the connection between Libyan black markets and his holiday destination in Aqaba or Sharm El Sheik." Then a final parting thought, (delivered with absolute certainty), and a wake-up call to those who believe that the reach of Islamic terror will not encroach on their daily life the way it does in other parts of the world. "If they think this is just Israel's problem, or just a Middle East problem, it is not." The ball is in the western corner. Everybody in this World knows how danger is the Open Advanced Weapons Market opened in the Middle East. With the sponsor or at least the closing eyes of governments in Sudan, Libya, and Egypt.The massive reduction of the tourism industry in the region was the undoubted respond for that. As well Everybody in this world knows that if the USA wants to impose a tight policy in the region to cut the flow of advanced weapons to this huge Arsenal and to stop it from growing and getting bigger day by day, Its well known that USA can enforce that. But will the USA and the western Countries do their part and start to tighten these regimes before they expand and get stronger, or they will make an excuse to inter their troops to a new corner of the region and start another war in 10 years or less.